$175 for allied dental personnel. Dental health care professionals completing this C. E. course will be able to manage dental patients on a variety of new pharmacologic agents. In addition the participants will be able to make appropriate decisions about how to incorporate new cancer diagnostic aids, adjuncts and oral screening tests in a dental practice. The pathology review will enable to the practitioner to provide a realistic level of diagnostic competence, prognosis and management of frequently seen oral conditions. Review some of the fundamentals of tissue sculpting using provisional restorations. Review the concept of immediate non-occlusal loading. Develop an understanding of how abutment selection can influence esthetic outcome. Dr. William M. Goebel received his DDS and MSD in Oral Diagnosis and Oral Medicine from Indiana University School of Dentistry and is Professor Emeritus and former head of the Section of Diagnostic Sciences at Southern Illinois University School of Dental Medicine. He holds staff positions at two hospitals and conducts a private practice in addition to teaching duties in the areas of Diagnosis, Medicine, Therapeutics, Anxiolysis and Pharmacology. He has published numerous articles in peer-reviewed journals, contributed chapters in several books and has been invited to lecture at numerous meetings, both internationally and domestic. Dr. Blackwell received his dental degree from the University of Illinois College of Dentistry and completed a General Practice Residency at Michael Reese Hospital and Medical Center in Chicago, Illinois. He is affiliated with the American Dental Association, the International College of Dentists and the Academy of Osseointegration. 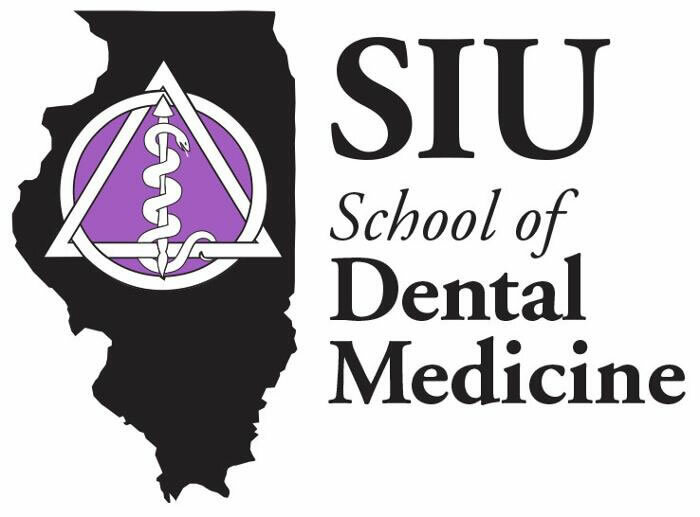 Dr. Blackwell is Chair of the Department of Graduate Education, Interim Chair of the Department of Applied Dental Medicine and Director of Implant Dentistry at the Southern Illinois University School of Dental Medicine. Dr. Blackwell maintains a private restorative practice, with an emphasis on implant restoration. Neptune Suite (SB) Floor-to-ceiling window/sliding glass door leading to your personal veranda, 2 lower beds convertible to 1 queen-size bed, bathroom with dual sink vanity, full-size whirlpool bath, shower and additional shower stall, large sitting area, private verandah, 1 sofa bed for 1 person. 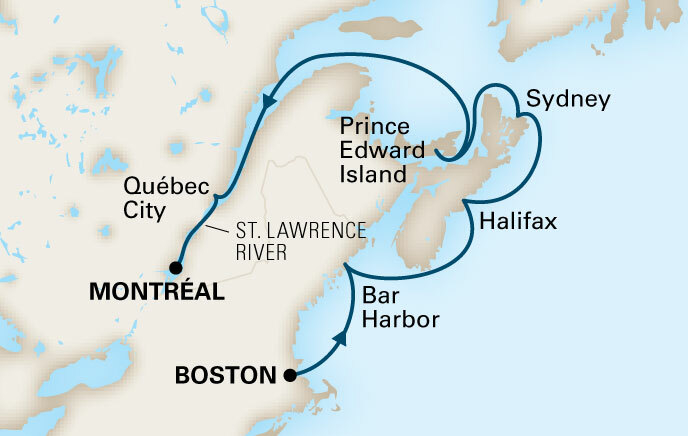 Suites also include a variety of firm, medium and soft pillows, no-host mini-bar for easy entertaining, personalized cruise stationery, over-sized bath towels, one-touch telephone concierge service, fresh flowers, and a complimentary DVD library. 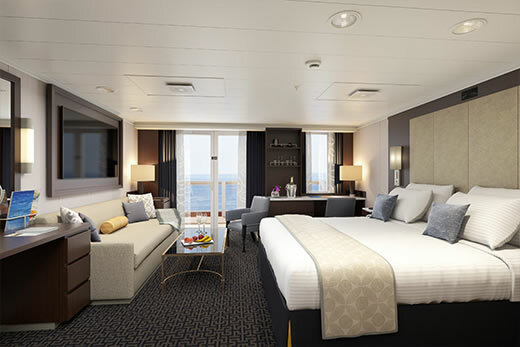 OceanView Stateroom with Veranda (A) - Floor-to-ceiling window/sliding glass door leading to your personal veranda, 2 lower beds convertible to 1 queen-size bed, whirlpool bath and shower, sitting area, no-host mini-bar, floor-to-ceiling windows. 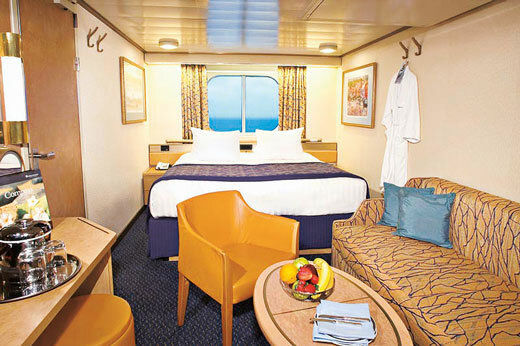 Includes all the stateroom amenities, plus signature Mariner&apos;s Dream bed featuring plush Sealy Posturepedic® Euro-Top mattress and finely woven cotton linens, luxurious bathrobes for use during your voyage, 100% Egyptian cotton towels, premium massage showerhead, 5x magnifying lighted make-up mirror and salon-quality hair dryer, fragrant soaps, lotions, shampoo and other bath amenities from Elemis Aromapure, complimentary fresh fruit on request, flat-panel TV and DVD player, ice service, shoeshine service and nightly turndown service. 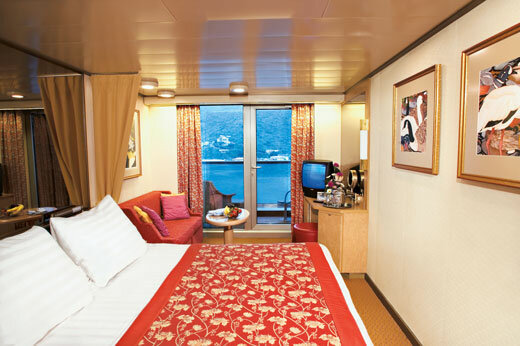 OceanView Stateroom with Veranda (B) - Floor-to-ceiling window/sliding glass door leading to your personal veranda, 2 lower beds convertible to 1 queen-size bed, whirlpool bath and shower, sitting area, no-host mini-bar, floor-to-ceiling windows. Includes all the stateroom amenities, plus signature Marinerâs Dreamâ¢ bed featuring plush Sealy Posturepedic® Euro-Top mattress and finely woven cotton linens, luxurious bathrobes for use during your voyage, 100% Egyptian cotton towels, premium massage showerhead, 5x magnifying lighted make-up mirror and salon-quality hair dryer, fragrant soaps, lotions, shampoo and other bath amenities from Elemis Aromapure, complimentary fresh fruit on request, flat-panel TV and DVD player, ice service, shoeshine service and nightly turndown service. 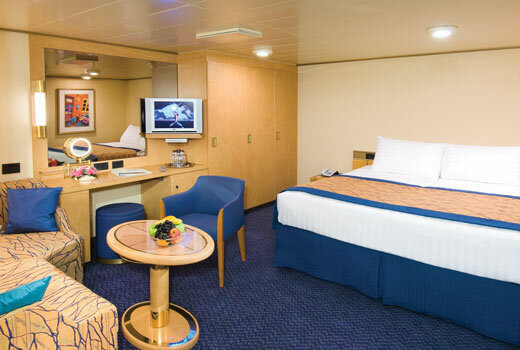 OceanView Stateroom with Veranda (BB) - Floor-to-ceiling window/sliding glass door leading to your personal veranda, 2 lower beds convertible to 1 queen-size bed, whirlpool bath and shower, sitting area, no-host mini-bar, floor-to-ceiling windows. Includes all the stateroom amenities, plus signature Mariner&apos;s Dream bed featuring plush Sealy Posturepedic® Euro-Top mattress and finely woven cotton linens, luxurious bathrobes for use during your voyage, 100% Egyptian cotton towels, premium massage showerhead, 5x magnifying lighted make-up mirror and salon-quality hair dryer, fragrant soaps, lotions, shampoo and other bath amenities from Elemis Aromapure, complimentary fresh fruit on request, flat-panel TV and DVD player, ice service, shoeshine service and nightly turndown service. OceanView Stateroom (D) Picture window, 2 lower beds convertible to 1 queen-size bed, bathtub and shower, luxurious beds featuring SealyÂ® Premium Euro-Top mattresses and finely woven cotton linens, deluxe waffle weave and terry cloth bathrobes for use during your voyage, 100% Egyptian cotton towels, premium massage showerheads, 5X magnifying make-up mirrors and salon-quality hair dryers, fragrant soaps, lotions, shampoo and other bath amenities from Elemis Aromapure, complimentary fresh fruit on request, flat-panel TV and DVD player, ice service, shoeshine service and nightly turndown service. OceanView Stateroom (CA) - Picture window, 2 lower beds convertible to 1 queen-size bed, bathtub and shower, luxurious beds featuring Sealy® Premium Euro-Top mattresses and finely woven cotton linens, deluxe waffle weave and terry cloth bathrobes for use during your voyage, 100% Egyptian cotton towels, premium massage showerheads, 5X magnifying make-up mirrors and salon-quality hair dryers, fragrant soaps, lotions, shampoo and other bath amenities from Elemis Aromapure, complimentary fresh fruit on request, flat-panel TV and DVD player, ice service, shoeshine service and nightly turndown service. Inside Stateroom (J) - 2 lower beds convertible to 1 queen-size bed, bathtub and shower, luxurious beds featuring SealyÂ® Premium Euro-Top mattresses and finely woven cotton linens, deluxe waffle weave and terry cloth bathrobes for use during your voyage, 100% Egyptian cotton towels, premium massage showerheads, 5X magnifying make-up mirrors and salon-quality hair dryers, fragrant soaps, lotions, shampoo and other bath amenities from Elemis Aromapure, complimentary fresh fruit on request, flat-panel TV and DVD player, ice service, shoeshine service and nightly turndown service. This grand luxury hotel has been symbolic to Boston&apos;s rich history and culture since 1855. This grand luxury hotel has been symbolic to Boston&apos;s rich history and culture since 1855. Old-World charm and elegance are accompanied by all of the modern conveniences of a world-class establishment. Nestled in the heart of downtown Boston, Omni Parker House is located along the Freedom Trail and at the foot of Beacon Hill, Boston Common, Quincy Market and Faneuil Hall Marketplace. Omni Parker House is just 2.3 miles from Logan International Airport (10 minutes). Our hotel offers the perfect destination for the leisure traveler, while our services and amenities appeal to those looking for a first-class business hotel in Boston. 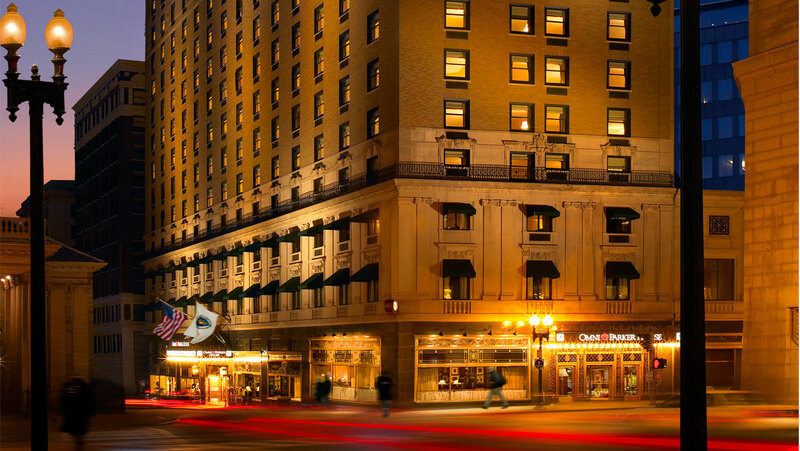 Experience the seamless blend of modern amenities and historic charm at America&apos;s longest continuously-operating hotel. Rate: $259 Single/Double 1 King Bed Plus 14.45 tax per room, per night. 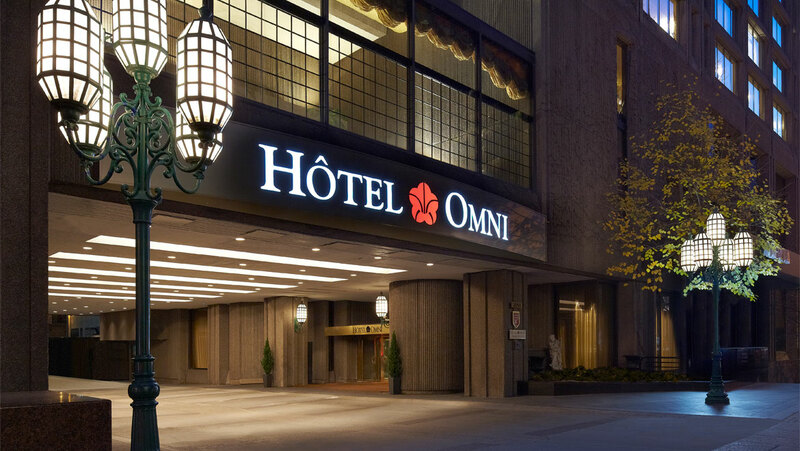 Located downtown on the elegant Sherbrooke Street West near McGill University, the luxury Hotel Omni Mont-Royal dominates the Golden Square Mile&apos;s historical district. Sophisticated, luminous and inviting, this environment showcases an authentic and refined stay. With never more than 12 rooms per floor, the hospitality experience is enhanced by luxurious and comforting loft style guestrooms. Towering the Mount-Royal Park, our 31 story hotel offers magnificent city views and an abundance of natural light. Honoring Montreal&apos;s reputation for gastronomy, Chef Laurent Miot and his international brigade, treat guests on a daily basis to a variety of local flavors à la Montré al. Our French inspired Petit Opus Café and vibrant Alice Bar reflect the city&apos;s rich diversity. A well known address within the business community, the hotel is best known for its dedicated and experienced personnel.